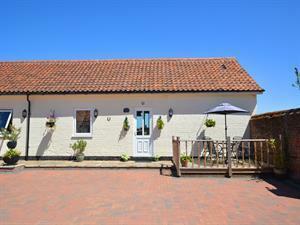 Anvil Cottage01263 715779work01603 870304fax Self-cateringSet in the heart of the countryside, the Norfolk Broads and just 8 miles to The Fine City of Norwich, Blofield Heath is a great location to explore Norfolk's attractions. Traditional country pubs and restaurants, within easy driving distance, boat hire available from South Walsham Broad and plenty of quiet country lanes for cycling or walks, this area offers a truly relaxing break at all times of the year.The Anvil, originally The Old Forge, has recently been refurbished to offer modern amenities in a one-level property. The accommodation is spacious and attractive, with open farmland views which you can enjoy from one of the secluded patios, with a relaxing drink.Set in the beautiful open countryside in the heart of The Broads, within close proximity of Norwich, this location is a great place where you can simply relax. Set in the heart of the countryside, the Norfolk Broads and just 8 miles to The Fine City of Norwich, Blofield Heath is a great location to explore Norfolk's attractions. Traditional country pubs and restaurants, within easy driving distance, boat hire available from South Walsham Broad and plenty of quiet country lanes for cycling or walks, this area offers a truly relaxing break at all times of the year.The Anvil, originally The Old Forge, has recently been refurbished to offer modern amenities in a one-level property. The accommodation is spacious and attractive, with open farmland views which you can enjoy from one of the secluded patios, with a relaxing drink.Set in the beautiful open countryside in the heart of The Broads, within close proximity of Norwich, this location is a great place where you can simply relax.